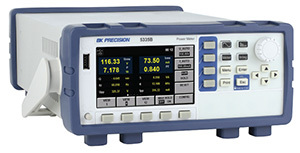 B&K Precision introduces the new 5335B, a single-phase AC / DC power meter designed for measuring and analyzing power consumption as well as power quality parameters. The 5335B quickly and accurately measures voltage and current up to 600 Vrms / 20 Arms with 0.1% accuracy and a bandwidth up to of 100 kHz. The front panel features an intuitive user interface with a large 4.3 inch color LCD screen capable of displaying measurement results in numeric or graphical format, dedicated function keys for 4 main measurement modes, and a USB host port. The meter measures all AC and DC parameters including power, current, voltage, power factor, frequency, and phase difference. Additionally, the 5335B features a powerful integration function which is useful for analyzing energy produced and consumed. It can also be used to evaluate total harmonic distortion (THD) to the 50th order and it can display voltage and current readings in the time domain with the oscilloscope function. The meter is optimized for pre-compliance testing according to international standards such as IEC/EN 62000-3-2 / 4-7. The optional TLBB53 breakout box simplifies the AC line connection between the power meter and the DUT with a universal socket supporting most plus used world-wide. The meter is also equipped with standard USB, GPIB, RS232 and LAN interfaces for remote control, data logging and data analysis.